Posh substitite Junior Morias on the attack against Fleetwood. Photo: David Lowndes. 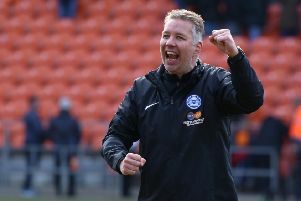 Peterborough United would have been dead and buried at half-time against Fleetwood at the ABAX Stadium today (April 15), but for some dogged defending by goalkeeper Luke McGee and emergency centre-back Andrew Hughes. Young left-back Lewis Freestone improved as the game wore on as did most of the Posh team in a 2-1 defeat at the hands of Fleetwood. Posh centre-back Micahel Bostwick alongside Fleetwood striker David Ball. Photo: Joe Dent/theposh.com. Posh debutant Lewis Freestone applauds the fans after the defeat at home to Fleetwood. Photo: Joe Dent/theposh.com. Posh midfielder Anthony Grant holds off Fleetwood striker Bobby Grant. Photo: Joe Dent/theposh.com. Paul Taylor: (for Borg, 82 mins).